Autumn is my favorite time of year. I love everything about it. The colors.. the temperature.. I cant wait! It will be here before you know it. It's time to start thinking about fall knitting! I'm starting to plan out my fall projects and I'm sure that you are too. 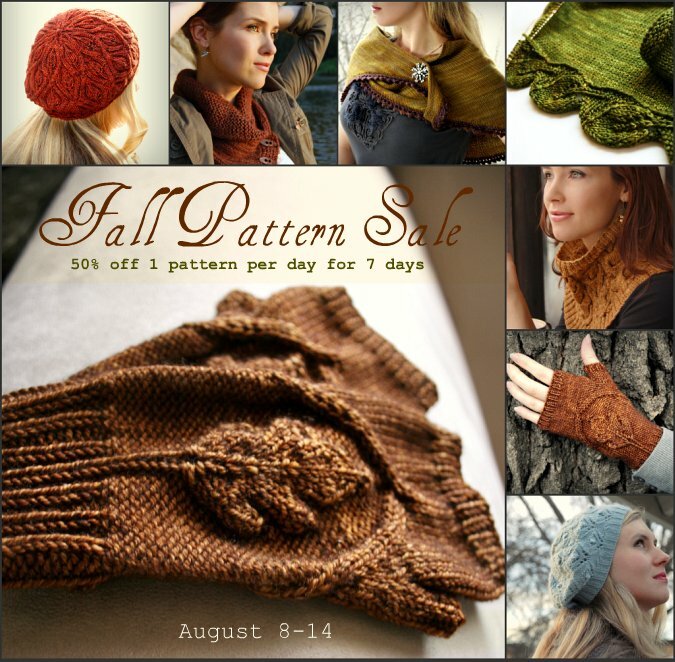 In anticipation for the season, I will be starting a Fall Pattern Sale tomorrow! This will be a fun, fast paced sale. Every day for the next week (August 8-14) I will announce one pattern that will be 50% off. You only have that day (until midnight Pacific Standard Time) to get the sale price, so you must act quickly! AND be sure to stop by every day so that you don't miss out on that pattern you have been eyeing! Now of course, this sale only applies to my pattern pdf downloads. If you would like to purchase the printed version of any of my patterns, please check my stockist list for the yarn shop nearest you.